Asked why she voted for Hillary Clinton in South Carolina's Democratic primary, Columbia resident Evelyn Boyd does not hesitate. "I want a woman to have a say-so in how the government is run," the African-American grandmother said. "Men have been doing it all along, and they don't do anything special." Along the U.S. presidential campaign trail this year, voices like Boyd's — championing the historic possibility of an American female president — seem to have been drowned out by the noise of the contentious presidential primary. In New Hampshire, young women like 26-year-old Karli Griffin see more in common with Senator Bernie Sanders than with the former secretary of state. "He is passionate about the issues that are affecting my generation," the retail worker said. For Griffin, it's not seeing a woman in the Oval Office that brings her to the polls, but the promise of free college. 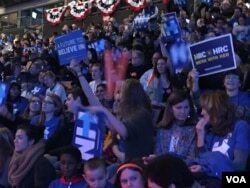 "A more educated populace can't hurt," the Manchester, New Hampshire, resident said. Longtime Clinton supporter Susan Donner, who is in her late 60s, takes a different view. "I support Hillary because she has more experience," Donner said. "Even though I know people don't always trust her, she has supported things important to me for many, many, many years, and that I do trust." The issue most important to this former social worker and retired associate dean at Smith College in Massachusetts is women's rights. "One of the things that impresses me most about Hillary is that she went out of here as secretary of state to really fight for women and girls around the planet, and they are more than half the planet," Donner said. FILE - Then Secretary of State Hillary Rodham Clinton shakes hands at Camp GLOW (Girls Leading Our World) run by the Peace Corps, in Lilongwe, Malawi, Aug. 5, 2012. This generational divide in how voters view Clinton's historic nomination and the possibility of a female commander-in-chief is not surprising, says Debbie Walsh, director of the Center for American Women and Politics at Rutgers University. "Women, particularly in their 50s and beyond, definitely have had the sense that it may not happen in their lifetime," Walsh noted. "Younger women totally expect that a woman will be president in their lifetime, and if it's this woman, fine. If not, there will be others." American women in their late teens and 20s have not lived through decades of white male presidents, instead spending a bulk of their youth with an African-American man at the helm of the United States. Many also have grown up seeing women in prominent leadership roles, including Supreme Court justices and speaker of the House of Representatives. "There is a sense out there when you look at the top tier that, oh, women have made it,'" Walsh said. "When in reality, women make up less than 25 percent of elected officials at the federal level, the state legislative and statewide elected office." Democratic presidential candidate Hillary Clinton arrives to speak at a rally in Entertainment Hall at the Florida State Fairgrounds in Tampa, July 22, 2016. And this gender inequality is not just confined to the political realm, according to Jackson Katz, the author of "Man Enough: Donald Trump, Hillary Clinton & the Politics of Presidential Masculinity." "There is a lot of naiveté and a lot of wishful thinking that we have already won those battles, that it's a settled issue that men and women are treated equally," Katz observed. "But we are not even close to gender parity in economic terms and social terms." Clinton's more than two decades in the public eye — as former first lady, U.S. senator, 2008 presidential candidate and secretary of state — also affect why many may not see the historic nature of her presidential nomination. "She is very much someone who people have opinions about already, so the fact that she is a woman has already worked its way into peoples' consciousness, even before she decided to run," said Georgetown University historian Michael Kazin. Or as Walsh puts it, "Some people sort of feel like she has already been in the White House." Angela Merkel, Ellen Johnson Sirleaf and Hillary Clinton? The fact is, however, no woman has ever occupied the White House as president of the United States. Around the world, the picture is different. The South Asian island nation of Sri Lanka elected the first female leader back in 1960, Sirimavo Bandaranaike. India was next with Indira Gandhi as prime minister in 1966. Israel's Golda Meir took the oath of office in 1969. Britain's Margaret Thatcher was elected prime minister in 1979. At least 63 nations have had a woman as head of state or government in the last 50 years. 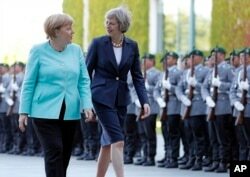 German Chancellor Angela Merkel, left, and British Prime Minister Theresa May walk on the red carpet during a military welcoming ceremony at the chancellery in Berlin, July 20, 2016. And whether it be Britain’s new Prime Minister Theresa May, South Korean President Park Geun-hye or Liberia's Ellen Sirleaf Johnson, women currently serve as heads of government or elected heads of state in 18 countries from Asia to Africa. "On every continent, there has been at least one woman head of state. We [the United States] really are in many ways playing catch up in this department," Walsh said. So why has the U.S. lagged behind the rest of the world? Many of the countries that have seen female leaders have parliamentary systems, where people usually vote for parties and not individuals. And nearly 100 nations have legislated or established voluntary quotas, setting aside a certain percentage of seats for female candidates. Having a female president or prime minister or even quotas, though, does not necessarily mean women are equally represented in levels of government. As of August 2015, only 22 percent of national parliamentarians around the world were women, according to the United Nations. The U.S. ranks 97th in the world when it comes to percentage of women in the legislature. And currently, women comprise only 20 percent of U.S. Congress. In the United States, women face obstacles getting on the ballot, when it comes to fundraising and being recruited to run for office, says Center for Women in American Politics director Walsh. It makes for a narrower pipeline to higher office. "When you look at who runs for president in this country, it's basically state governors and U.S. senators, and we have not had that many women," Walsh said. "The pool is just that much smaller. Right now there are only six women who serve as governors, and 20 women who serve in the U.S. Senate." The challenges for Clinton and other women in politics are not just material, but also cultural, says author Katz. Hillary Clinton "has to navigate this cultural symbolism that surrounds the presidency, that defines it in such clearly masculine terms," Katz said. "The president is not just the chief executive, the president is the commander-in-chief of the armed forces, the patriarchal figure that reassures the nation." Although the prospect of becoming the first female American president is not a main theme of her campaign, Clinton did acknowledge the historic significance of such an election during a recent interview on CBS' 60 Minutes. "I hope that it gives other women and girls the feeling that whatever their dreams might be, they can achieve them in this country," Clinton said.